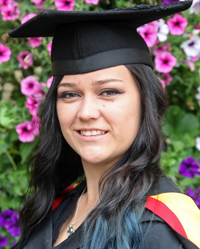 Rebecca SnellAn exceptionally active student with a passion for animals graduated from Bangor University this week. Rebecca Snell, 25, from West Kirby, Wirral graduated with a first-class BSc Zoology with Animal Behaviour degree after three years of study at the School of Biological Sciences. The former Reaseheath College student, never intended to study at university, however, a yearning to broaden her employment options along with frequent visits to meet up with friends already at Bangor, Rebecca took the plunge and applied. Throughout her time at university, Rebecca worked part-time during term, and full-time over the summer in various places and roles, from a seasonal keeper at a wildlife park in Leek, to a telethon assistant for the University’s Alumni Department. Rebecca started volunteering for the Welsh Mountain Zoo, Colwyn Bay before coming to Bangor, and has continued volunteering there throughout her degree. Rebecca said: “I’ll have been there four years this December, I absolutely love volunteering as a keeper there, it's a great zoo and the keepers are incredible at what they do. “The University runs its Bangor Employability Award (BEA) Scheme, which helps students increase their employability and professional skills, and through all my volunteering I was nominated for a Bangor Employability Excellence Award, which I won! “I was also involved in Bangor’s fantastic Peer Guide Scheme and became a head peer guide for the School of Biological Science during my third year. “Although I did not attend any of the School’s field trips, I had some time abroad through the Zoological Society. I took part in Cetacean (whale and dolphin) conservation, working with the Atlantic Whale Foundation in south Tenerife which I helped organise with the Society’s previous chair. “Throughout my time at Bangor, I was actively involved as a member of several societies including the Sci-Fi Society, Herpetological Society and the Endeavour and Coast Life Society. During my second year, I became a Zoological Society committee member, and a year later I was elected Chair. I’m very proud that the society won the Students’ Union Society of the Year and the Academic Society of the Year award twice! “My time at Bangor has enabled me to reveal my true potential, and reading what members wrote about the Society and myself in the Society Award nominations and the difference it makes to students’ university life was a truly emotional and humbling experience for me. 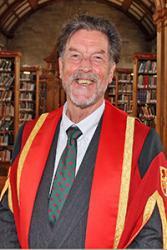 During the same ceremony, Nicholas Jackson OBE received an Honorary Fellowship for his services to zoology. He has over 40 years’ experience of working in zoology. His career began as an animal keeper at the ZSL London Zoo. He is Chief Executive of the National Zoological Society of Wales, Welsh Mountain Zoo at Colwyn Bay. His contribution includes his practical support of captive breeding programmes for animals to be re-introduced to their habitat and his valued support in educating the next generation of zoologists from Bangor University.